A blast from the past! Harry D, Miani and Shehan were lucky enough to meet and interview Dav Pilkey when he came to Australia for the Sydney Writers Festival in 2014. Check out this great podcast with Dav! 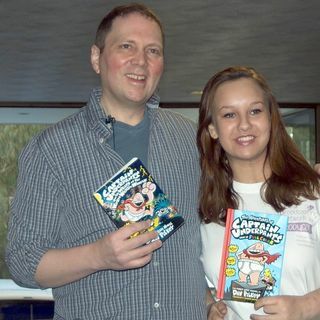 With well over 70 million copies sold, children's author Dav Pilkey has penned and illustrated numerous popular, award-winning books for children, including the Captain Underpants and Dumb Bunnies series; Dog Breath, winner of the California Young Reader Medal; and The Paperboy, a ... See More Caldecott Honor Book. He lives with his wife in the Pacific Northwest where he divides his time between Bainbridge Island, WA and Minami Izu, Japan. And as you will hear in this interview Dav even get to write in his own cave!